I’ve had a few questions about the Samyang 8mm fisheye that I use for my surf photography in my Liquid Eye C6000, Salty Surf Housings Basic and converted Aquatech housings. I shot a short video which covers the main things I like about it, the limitations it has and the basics of how to get good surf photos with this kind of lens. Samyang, Rokinon, V1, V2, e-mount, x-mount, silver, black etc. etc.? Unfortunately there is quite a lot of confusion around this particular lens, there are several different variations on the same, or very similar design. There is a version 1 and a version 2. The version 2 is newer, longer and technical tests show it has a slightly higher image quality whilst being slightly less wide than the version 1. I’ve used both versions for surf photography and in my real-world use I can’t tell them apart when comparing the final images. They are both great, small, good value lenses. So choose version 1 or version 2 depending on the dome port you are going to be using and the price you can find them for. If you have, or plan to get a Salty Surf Housing go for the version 2. UPDATE: If you’ve got or plan to get the Liquid Eye C6000, you can get either version of the lens, just make sure you get the port that matches your lens as they offer one for each version. Here are a couple of links for each version in the Sony e-mount (compatible with the Sony a6000) on Amazon, double check if you’re not 100% which one you need before ordering, the prices vary a little between brand and version but they’re around $280 on average. It should be that simple, but unfortunately there are some other confusing things to watch out for. Samyang Optics are the company making these lenses, but they are sold under different brand names in different places. I have the versions with Samyang printed on them, but in North America you’re more likely to find the same lens with Rokinon printed on it. Samyang also make other lenses and stamp them with the following brands: Bower, Walimex, Pro-optic. But I don’t think they make the 8mm f2.8 fisheye in anything other than Rokinon and Samyang (I might be wrong though). If you find an 8mm f2.8 fisheye that looks like one of these but has a different name on it, the lenses are all the same, only the names have changed. They also make a very similar 7.5mm f2.8 fisheye for the micro four thirds mount, which is smaller and less wide (because the micro four thirds sensor is smaller than the APSC sensor). Even more confusingly they produce a lens with exactly the same optics inside it but with a de-clicked aperture ring and a gear built in to the focus ring for cinema use. This one’s called the Rokinon 8mm T3.1 UMC Cine Fisheye II, but if you put it on your Sony a6000 you would get the same image as the regular 8mm f2.8 fisheye. Just to make it a little bit trickier for the casual observer to know which lens I’m talking about Samyang also make another 8mm fisheye, this one’s got a maximum aperture of f3.5 and a removable hood, so it’s easy to tell apart. It’s also made for DSLR APSc lens mounts like Nikon and Canon EF. OK, now that’s out of the way, on to my short review of the lens itself for surf photography. That’s probably all you need to know, but if you want examples and more non technical views of the lens read on. The sharpness and contrast easily compares to the Tokina 10-17mm fisheye I used on my Canon DSLR’s, and the Canon 15mm f2.8 fisheye that I owned briefly and used on 35mm film SLR’s, a 60D and tested briefly on a Canon 5D mk II. Just get the settings right and you’ll be happy with the quality of the shots. I don’t zoom in on the corners of my photos and the majority of my shots are published on line, but I have had a photo I took using the V1 of this lens printed in Wavelength magazine, and I’ve printed several at A4 size myself (there’s one on the shelf behind me in the video above) and I’ve been very happy with the image quality. The lens is manual, you set the focus and the aperture on the lens itself and you can’t change them using your camera buttons. This is a good thing. 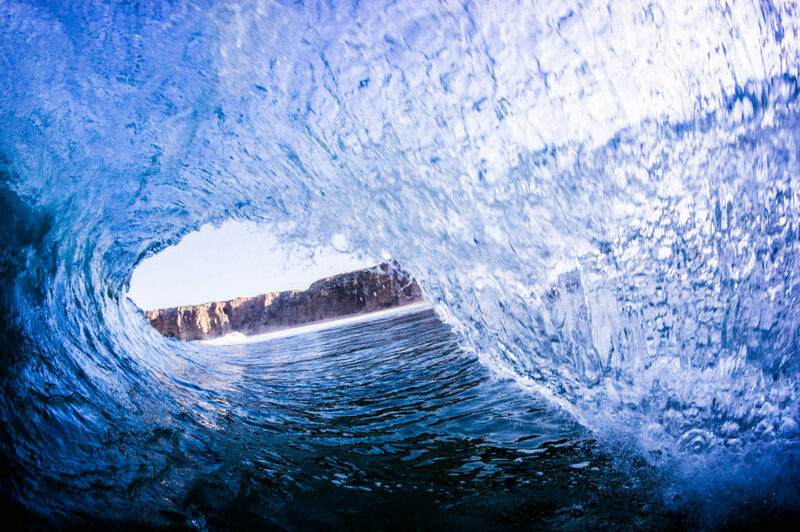 When I shot with my Tokina 10-17mm (I took over 7,000 shots with this lens on a variety of bodies) I would set it to manual focus and tape it in position before 90% of the surf photo sessions I had. With any photography you should experiment and see what works for you, no wave is the same and no lighting is identical, so my settings might not work for you. But… I’m going to give you my basic settings as a place to start with this lens, then you can tweak them to find the look and feel you prefer. Start there and see what you get. Water Housing Users Guide: Part – Which Port Should I Use? Basically, you need a dome port. You want a big one for underwater or over/under style shots but a small one, like in the video, will work for above water, and it’ll stay out of the way too. This was shot looking straight up, you can see the land on both sides of the frame, it’s such a wide lens you need a dome port so you don’t get the port in the shot. I love my Samyang 8mm f2.8 fisheye, it’s super fun to shoot with, it’s tiny and the image quality is great. There’s a good reason that the most popular water housings for the Sony a6000 have dome ports that are designed for this lens. The best way to support this site is to make a purchase through Amazon using my links. You pay the same price and I get a small commission. Samyang/Rokinon/Bower V2 port is available for the C6000/6300 Liquid Eye water housing. I’ve updated the post to reflect the new port. If you’re using a dome port you’ve got the right technique, I’d say you’re almost certainly not spitting on the dome enough. It’s a bit disgusting, but I spit on the port at literally every opportunity for the first 15 minutes or so after getting in the water, you can’t do it too much. Every time I lift it out of e water between waves I spit on it. If there’s no waves coming I spit on it, just keep spitting on it and try and cover the whole dome. Once you’ve got a good layer on the outside of the port it will keep the drops from forming for a good few seconds after you lift it out of the water. If you’re using a flat port then you should use a different technique. Do you have a secret method of putting the camera to sleep while in the housing with this lens? Ive found a work around for my AF lenses but with the MF it doesnt work…. I don’t have a secret method – I find when I’m shooting fisheye I don’t have too much time in between sets in any case – but if I do find myself sitting around for a bit then I just turn the camera off and switch it back on when a set approaches. The a6000 will power on in no time and you can usually start shooting within a second or so. I think that might be the work around you’re already using, as it involves auto focus settings. If it is, let me know and I’ll see if I can figure out a way to get it to happen with a manual focus lens in place. I’ll do some experiments just in case. Thanks for getting back to me, Ben. Yea the method on the saltysurf blog is what I have been using but it doesnt work for a MF lens. Will try playing around with it tonight to see if I can come up with something as well since the salty housing doesnt offer an on/off switch. Hey Allan, just had a good chance to play around. Turns out you can use the same trick with a manual focus lens – you just need to change the custom setting to one that doesn’t involve focus. Go to Menu, go to the 6th tab of the cog icon section, go to Custom Key Settings, change Center Button to Image Size (I chose this one as I shoot raw+jpeg so this doesn’t make a big impact if I accidentally change it mid session, if you shoot jpeg only you might want to choose something else), then if you press the center button in the housing and leave it on the size selector screen, it’ll go to sleep in one minute (if your sleep time out is set to 10s or 1 minute). This should work with any lens, auto or manual focus. Still a bit of a pain having to press the button every time, but should help once you get used to it. Samyang 8mm f/2.8 UMC MF AS IF Fish Eye Lens for Sony E-mount is the same as the ones listed above? …….the MPN’s differ, thanks in advance as I don’t want to purchase the wrong lens. After a google search of that MPN I went to three or four sites which sell that lens and they were all the V1 lens that I’m talking about in this post as far as I can tell. This is the shorter version, so make sure that’s compatible with the housing and port you want to use it with if you’re going to shoot in the water. hi Ben, i have a sony a6000 with a meikon dive housing, i want to try it out for surf photography as well. Do you know if the sony 30mm macro lens and the rokinon 8mm fit in it? I suspect at least the rokinon may not due to length but perhaps the sony 30 mm does. any experience with them on the meikon housing? The Sony 30mm macro will fit. 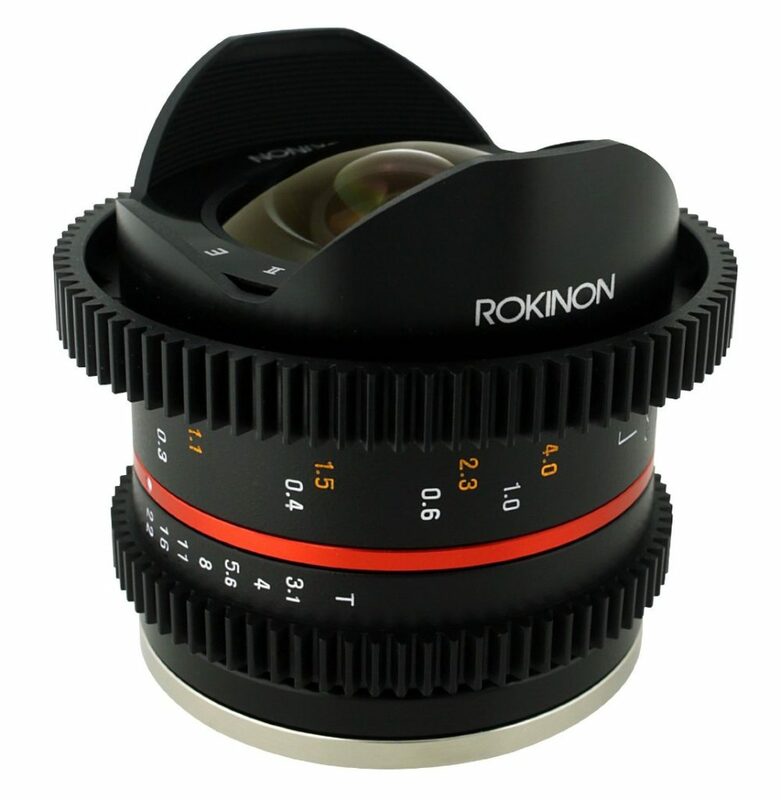 The Rokinon 8mm (might just be the V1, not the longer V2) will only fit if you remove the lens hood. This isn’t trivial as it’s permanently attached, so you need to cut or grind it off. Even if you remove the hood it will vignette so badly in the flat port that it’s not worth it. You need a dome port to use a fisheye lens in a housing. Try it out with the 30mm and if you like shooting surf photos and want to start using a fisheye you can change to a housing with interchangeable ports. The Sigma isn’t a macro lens, so you won’t have that close focus capability that you would get with the Sony. If that doesn’t bother you then the Sigma is a great lens. The Sigma doesn’t have the same full compatibility with Sony’s autofocus modes, but I didn’t have any issues when I was using mine if I used the centre focus point and continuous focus. If you’re shooting at f2.8 you’ll be able to tell the difference, and if you stop the lens down to match the 16-50mm it should still give you a sharper image than the kit lens. It might be worth setting the 16-50mm up at 30mm to see if you like that focal length. I love my Sony 35mm f1.8, but some people prefer wider or longer, and you’ve got plenty of alternative options for lenses. oh didn’t know the sigma was not a macro, i would like the macro since i plan to use it also for diving or small wildlife so then probably the Sony is a better bet. Thanks for the tip about testing the kit lens at 30mm, that would be a good testing.thanks! Do you have any recommendations on which focus distance to use underwater with the Samyang 8/2.8 II? I found that set to infinity not a single picture was in focus. Btw I am using a 6″ liquideye dome. I also wonder if I have to use a different focus distance for underwater shots when using the smaller 4″ dome. Longer explanation – When you’re shooting with a dome port underwater you need to focus as close as possible. A dome port surrounded by water effectively creates another lens that isn’t there above water, that creates a virtual image that’s much closer than the real things that you want to focus on underwater. Practically, it means the smaller the dome, the closer you have to focus, but with a 6″ or a 4″ dome and the Samyang 8mm f2.8 fisheye, you want to focus as close as possible. Use as narrow an aperture (biggest number) as possible, to give yourself the best chance of getting sharp focus. The only time I set it to infinity is if I’m shooting night time photos of the stars. Generally I set it to about 1m when shooting above water surf photos, then an aperture of f8 or f11 if it’s sunny, or f4 if it’s dawn, dusk or really cloudy. If you have focus at 1m at f8 then pretty much everything above water will be in focus. I will try my best and set the focus as close as possible. 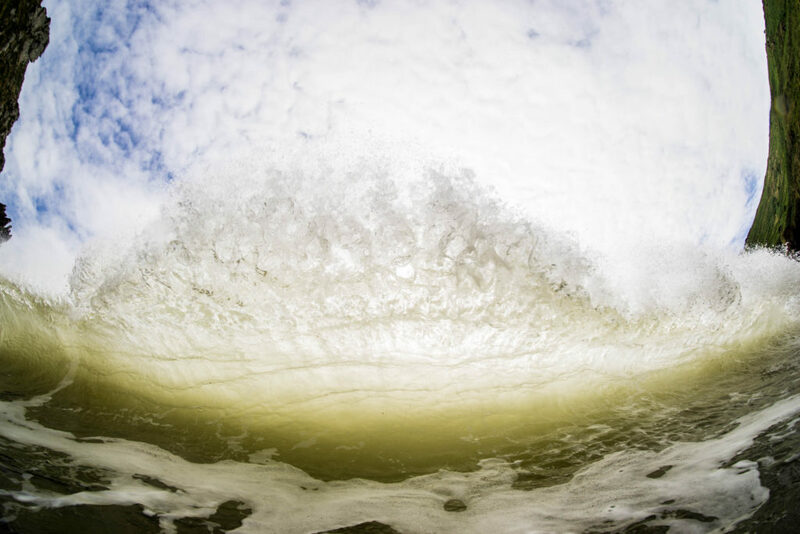 being a surfer and photographer, i feel highly motivated to move myself into surf photography. After some research, i would start with a sony alpha 6300 with the 16-50mm kit lens and the Meikon Seafrogs 60m waterproof housing with dry dome port and pistol grip. 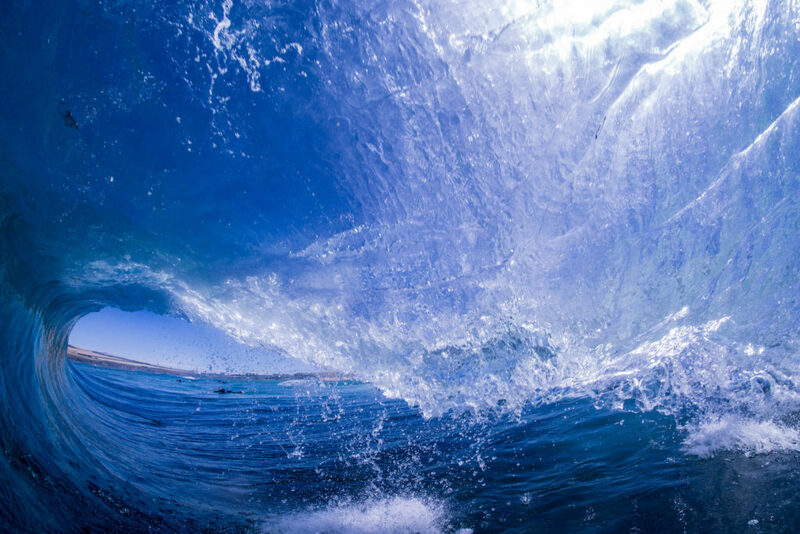 For hollow wave shots and underwater shots i’m thinking the Samyang 8mm f2.8 lens would be good. In the discussion above it says the Samyang 8mm lens is not compatible with the Meikon housing due to the lens hood and vignetting problems. Would this problem be resolved if i opt for the dome port instead of the flat port or would I still experience the same problems? Kind regards! This video was made before the latest Meikon/Sea Frogs housing was announced, but there was an older Meikon housing which didn’t have interchangeable ports – that’s the one I’m talking about in the video on this page. The Sea Frogs Salted Line a6xxx housing has a couple of dome ports available now. The other dome is too long for the short Samyang fisheye. Don’t forget to use the code LSP at checkout when ordering from the seafrogs website for 5% off.